Video Of My Recent Talk: Exploring The Ex-Vegan Phenomenon. Plus, Best Day Ever? Perhaps! Hello hello! I’m so excited to share this video of my recent talk, Exploring The Ex-Vegan Phenomenon, with Matt Ruscigno, MPH RD, at the amazing Animal Advocacy Museum in Pasadena. The issue of recidivism in the vegan community is incredibly complex, and Matt and I are still in the beginning stages of mapping out and understanding all the intricacies. But it’s exciting work, and such important work (nobody else is talking about this! ), and I’ll continue to share our findings with all of you as things progress. This event, our first public appearance speaking together on the topic, was super fun and well attended, so thank you to everyone who came out and participated! Matt and I believe that this is a critically important issue for the future of the vegan movement. So please, watch the video and share your thoughts in the comments, on social media, and in your own communities. Let’s get this dialogue started! Because the sooner we can do that, the sooner we can begin to brainstorm effective solutions. Special thanks to Prabhat and the amazing Animal Advocacy Museum. They’re a seriously fantastic organization, so please check them out! Jeremy and I made the drive down from Santa Barbara in the morning, nice and early to avoid any traffic. My number one biggest fear in the world is public speaking, so I wanted to be sure we got there with plenty of time to prepare. 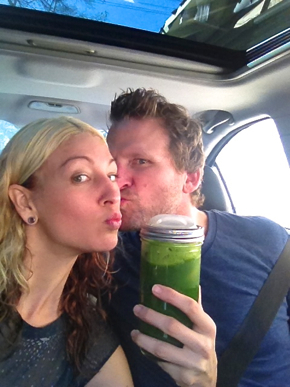 Jeremy made us a giant green juice to share in the car – truly the perfect way to start a day! We made it down in excellent time. The day was clear and bright and warm, just perfect for a drive down the coast. And having made such great time, and having a pretty light breakfast, our first stop in LA was for lunch! 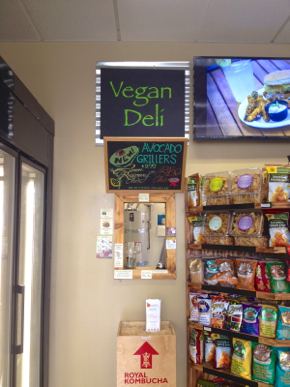 We decided to check out a brand new spot called Organix Vegan Deli, on the advice of Quarrygirl who raved about their jackfruit “puerca” sandwich. Organix Deli is just a little walk up window with a single table, at the back of a wee health food market. But oh my god you guys. YOU GUYS. I can’t. I just can’t even. This food was so good. Unexpectedly, mind-blowingly, outrageously delicious. 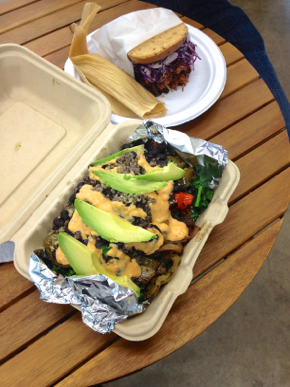 Jeremy got the puerca sandwich and a mini tamale, and I got a burrito bowl with chipotle aioli (both gluten-free). And I’m going right back for more as soon as I’m in LA again. Anyone who lives down there – GO! NOW! After lunch we made our way over to the Animal Advocacy Museum so that I could prepare. I met the organizers, met with Matt, and got myself ready. Well you know how it went! You can watch the video above! You know, public speaking is my phobia, to such an extent that it’s actually held me back both academically and in my career (which is why I’m trying so hard to confront it, now). But the thing about public speaking is, every time I do it, I have a blast. And afterwards I always think, “That was so fun!!! When do I get to do it again? !” So I try and keep that in mind going into it now. I think it’s helping. After the talk we stuck around for long while, chatting with folks and mulling over the many complexities of this issue. I even got to meet a few Bonzai readers, which was so, so awesome. Hi guys!! Eventually though, we had to excuse ourselves. We had a party to attend! Jason Wrobel, vegan chef extraordinaire, has recently debuted his ALL-VEGAN cooking show on the Food Network’s new sister station, The Cooking Channel. 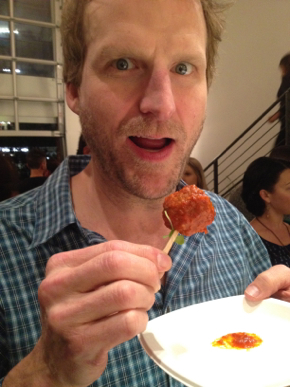 Jason’s show, How To Live To 100, is funny and fun and packed full of amazing vegan superfood recipes. 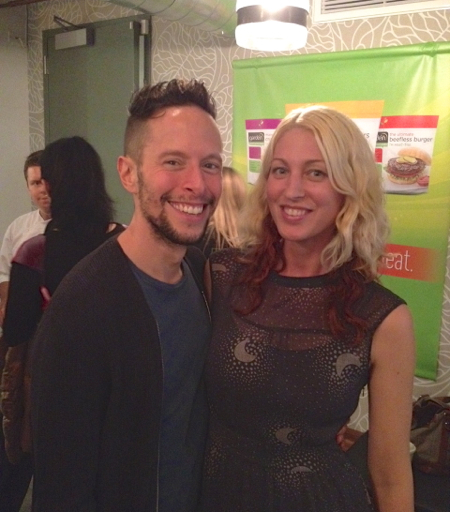 Check it out and support the first-ever vegan cooking show on mainstream television! 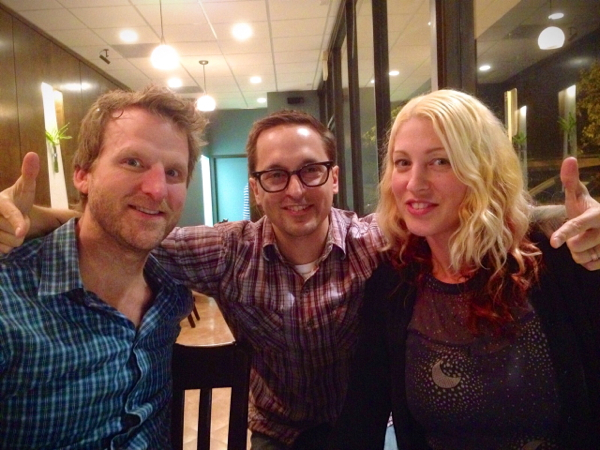 It was great to reconnect with Whitney and Jason, to meet so many amazing people for the first time, and mostly, to witness this incredible step forward for veganism. Let’s bring this thing to the mainstream! Afterwards, we stole away with a pair of fellow party-goers, for a late night visit to LA’s newest vegan Thai restaurant, Satdha. Satdha is all-organic and exclusively vegan, with clean fresh flavors and inventive offerings. This food is pretty epic – definitely a “must try” for those in the LA area. Mostly though, I was just happy to have a quiet meal at the end of a long day, with excellent company. Geoff and Kylie are friends of Jeremy’s, and I met them on the same day that I met him, last year at LA Vegan Beer Fest. Geoff actually appointed himself as Jeremy’s “wingman”, when he walked up to me at beer fest and started chatting, to break the ice. He likes to take credit for our subsequent romance, and feigned disappointment at not being included in my 2013 Recap when I finally spilled to you guys about Jeremy. So here Geoff, for you – front and center! Thank you, friend, for being bold and taking the initiative that day. We will forever be grateful! And then? A late night drive home, holding hands, chatting at the end of a very long day, and then straight to bed for us. Tuckered out, and grinning into sleep. Congrats on a great speech and what looks like such a fun evening! I was very impressed by how you kept your cool through cell phones going off and all that extraneous noise! As someone who has jumped into, and out of, the pool of veganism, I really appreciate your and Matt’s attention to this subject. Well done! Thanks so much for sharing your talk, Sayward! Wonderful job, and congrats on your new endeavor! 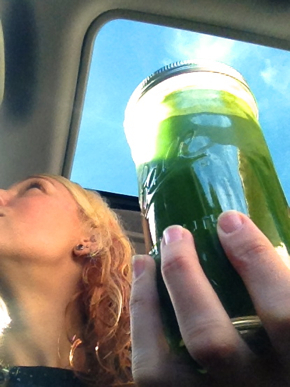 Side note: I’m always so jealous of your green juices–they look divine! Ooooh, I must watch your talk! Vegan recidivism just blows my mind….and makes me sad. When I hear of vegans (mostly internet vegans who I don’t know in real life) going back to the dark side, it just breaks my heart. And I spend way too much time obsessing over why they’re doing it (seriously, I think about people I don’t even know and why they’re going back to eating meat all the time….like while I’m cleaning the house and while I’m walking my dogs). It really bothers me. I try to be respectful and understand that everyone has to do what they think is right for them. And I would never preach or scold anyone for going back. But I can never get over it. I don’t for the life of me understand how someone can live an ethical life and then suddenly go back to eating meat. I don’t understand how they can live peacefully with that decision. Blows my mind. Once your eyes are open and your heart is enlightened, how does one go backward? Thanks for sharing! What a powerful video. I’d love to know, if you’d like to share, what specifically you did to improve your protein and cholesterol intake. 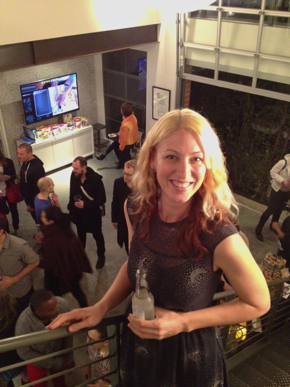 I’m sorry I missed your talk, but it was so much fun hanging out with you and Jeremy at the launch party and at Satdha after. Always a pleasure spending time with you two, your energy is infectious! Thank you so much for sharing this, Sayward. I especially enjoyed the point about the dangers of promoting veganism as being easy. I also find Matt’s discussion about being a ‘quiet’ vegan vs. one who makes ‘every meal a moment of activism’ very interesting. It can be very difficult to strike that balance – I tend to be quiet, despite often feeling like I should be sharing my views in a more open way. I don’t always know how to do this without being overly negative or ‘preachy’. I often feel like not only could I be doing more to encourage others to reconsider their eating, but also that because I rarely share my whys of veganism, people don’t actually know why I’m doing it. I would love to see a book, and look forward to more discussions on the topic. This was a really great talk, thanks for sharing. It really brings up some interesting points and I think it’s a very important discussion to have in our community. We never talk about these things, we kind of brush them off. I love the idea of a book, I think it’s a book that needs to happen, and you two seem the perfect people to write it. I also like the idea of vegans being trained in advocacy, the truth is a lot of vegans really aren’t that great at it, and you’re right that the focus is always on recruiting ‘new’ vegans but there is no emphasis whatsoever on helping people stay vegan – this definitely needs to change. I hope there will be more talks or posts along these lines! Great stuff! Dang, girl, you are on fire! I love the enthusiasm and confidence in your voice and writing. Matt is so awesome, too. Thanks for the restaurant recommendations. Woo-hoo!!! Thanks Jessica! And yeah, the noise was a bummer on the video, and I’m sorry about that – I know it was distracting. It actually didn’t seem as loud in person. I thikn the mic just really picked it up, unfortunately. Do you have a juicer yet girl? Oh Bianca you have to watch it! I actually speak to exactly what what you’re describing here – that feeling of not being able to understand how someone could go back. I think it’s something that a lot of us say in an offhand way, but I think it’s actually something we need to examine. Anyway, you’ll see when you watch. I spend a ridiculous amount of time worrying and wondering about ex-vegans as well, so I hear you girl. Hopefully this project will give us all a place to channel that frustration! I think I’m going to write an entire post on that, actually. I get that question a lot and it’s about time I officially wrote about it. So yeah, look for that coming up soon! Thank you, that’s so great to hear that my story is helping and inspiring people. That’s exactly why I do what I do, so thank you! Always so fun Kylie! Now you guys gotta get yer butts up here! Mischief!!! Hi Emma, thanks for the comment. You make interesting points here and we spoke a little bit about this in the discussion. People often ask “how should I act in X situation?” or “what should I do in this case with this person?”, etc. I always tell people you have to be authentic. If being a bit more quiet is where you’re comfortable, then that’s just who you are, and that’s your brand of outreach/activism. Remember that you might be influencing countless people without ever even realize it – people who appreciate being able to witness you being vegan without having to confront it and talk about it. You never know, but i think that’s an important face of veganism – which, in order to be effective, needs to have myriad faces. Thank you Kyleigh, I really hope the book happens too! But either way, I’m just so excited to be tackling this topic. Definitely more posts and more material on this topic in the future. Thanks for watching! Aww, thank you Carrie! Hey, next time you’re down this way we should meet up! If you’re ever going to be in LA, let me know. I can make a day trip down. I’d love to get together and gab! Hi Sayward! I feel very compelled to add to my initial comment because, truthfully, I didn’t watch your presentation until this morning. WOW. I am so fascinated by this topic as well and feel so motivated to share my story and tips on my blog in the future. I also wanted to apologize for not being able to attend the lecture. I had been in LA a few days prior for my cooking demo and wasn’t able to come back into the city. However, you and Matt really did present fantastic information and points of view. I love the idea of this topic being fleshed out (ew, icky term) to a full book because, as both of you emphasized, it doesn’t make sense for our community to say how easy it is to go vegan in order to get people to do it, if they won’t STAY vegan for the long term. It really is a step backward to have people test it out, feel worse, go back to eating meat, and then talk badly about veganism. I’ve agree with Matt that it’s so easy to forget how much information all of us have gathered on our journey as vegans. I know that I’ve spent the good part of my 3 years as a vegan doing research and getting input from the best sources possible, not to mention having the experience of being a graduate student and having access to all of the published research. If anyone is reading this comment and is curious about my specific food tips, I would say that supplementing with an algae-based EPA/DHA (or eating plenty of omega-3 containing plant-food foods), rotating greens, getting enough healthy fats from nuts and seeds, and in general consuming whole, plant-based foods is how I feel the best. I’d also say that is does take constant tweaking for me to feel good, and a commitment to avoiding sugar, over-working, over-exercising, managing stress, making sure my female hormones are okay (I have PCOS), just to mention a few non-vegan related things. I feel with this holistic approach, I will be able to stay vegan for the long-term which is really important to me from an ethical standpoint. Anywho, thank you for your continued honesty with this, Sayward, and for being so brave and resolute. I take strength and hope from this presentation. Anyways, as an MD, it bothers me to see nutritional advice from anyone with an agenda (ie selling something). I recently highlighted a bunch of vegan nutritional books I recommend because I don’t consider myself an expert, either.. or have the time to dedicate myself to the effort of making this a better community.. and will instead lead people to others I trust. I suppose it is a different kind of activism. Know your own limits. Fantastic presentations. What a shame about the distracting sounds on this video. If you do another presentation, maybe you can put up a version without the phones, squeaky doors and revved motors. Certainly, there are others (such as Jack Norris) who have published information on veg recidivism, but this is a topic that merits more discussion, especially from a compassionate perspective as you’ve both shown. I guess ‘veganism isn’t that hard, but its not easy’ may be my new response. It definitely has its challenges, but so do most of the great things in life. When I became vegan, I aimed to eat vegan for 10 days, and take it day by day. I found it wasn’t so hard, and I kept doing it a day at a time. After one year, I felt I could probably stay vegan, since I’d been through all the seasons. It’s been a few years now, and of course I plan to be vegan for the rest of my life, but I always wondered what I would do if medically I needed to eat animal products again. Would I let myself wither and die (maybe), would I look for vegan alternatives (probably), or would I go back to taking other lives, to protect my own (maybe, but I really hope not). I haven’t met too many vegans in my life, but I recently met one who is undergoing cancer treatments. It shocked me. I wondered to myself what kind of vegan food is she eating that would give her this!? It is such an unfair judgement – there is a good chance she eats healthier than I do (since I have a sweet tooth). So, the point Matt made about how the risks of heart disease and cancer just don’t miraculously disappear if you are vegan is a great point. How about an e-course on how to be a vegan advocate? Perhaps in conjuction with the Humane Ed program at U. Valparaiso so that people who might want to transition into that program can get credit? What would be great is if a few different recidivism experts could take turns in writing a column for VegNews, answering questions from vegans who are struggling with serious issues that might prevent them from continuing a vegan lifestyle? Perhaps that might help develop the basis for a book in the future. My thanks to all those who are helping the animals, including the human ones, through the vegan lifestyle. It means the world to me, and I’m sure to many, many others too. Sorry for how long this is. . . .
purpose for living this way. No worries; didn’t prevent me from hearing any of the speech. I just know how it can be distracting and unnerving while doing public speaking. Rock on! Thanks for posting the video, actually got to watch the whole thing without being interrupted by screaming children! :) It was nice to hear the story of your spell of illness in more detail, and to have Matt put a different perspective on the topic, especially since I’m a fairly new vegan and especially struggled over the holiday season. I agree; it is an extreme overload when you are first starting this lifestyle change. Especially while sharing your roof with a robust carnivore! I’m sure healthy dietary changes decrease your chances of developing certain cancers/other health issues, but that doesn’t discount genetics and environmental factors. rhys southan’s blog is another good resource for open-minded discussion of recidivism from the point of view of an ex-vegan (who still cares about animal rights and the ethics of food). meat-craving vegan-haters is largely mythology (promoted by a few vocal internet trolls). In fact, many of the ex-vegans I know continue to live a vegan lifestyle or a mostly vegan lifestyle. Pythagorean crank and happy herbivore are perfect (in the public) examples of this phenomena. I was as well. While I now call myself vegan I’m not particularly happy about this identification. IMO, we need a new word to describe people (vegans/ex-vegans) who still seek to reduce exploitation but don’t give a fart about deontological purity. And it’s this kind of attitude, bohemianmatka, that pushes people away from vegans and veganism. After 20 years of vegetarianism, I found out that I have degeneration in my spine, among other things, caused by nutritional deficiencies. After 20 years, you can’t say I didn’t give it a fair shake. And in my case, at least, it is not genetic. Vegetarianism/veganism is just NOT for everyone. We should be less concerned about furthering an agenda and more concerned with realizing that health is the most important thing. Without my health, I can’t teach and encourage my special education class and I can’t rescue dogs. I also can’t worry so much about buying organic and local. I just wish people would understand that one diet/lifestyle is not going to work for everyone. We can all live in harmony, but we don’t all have to be/do/believe the same.
? Kim, I’m sorry, you must have misunderstood my comment. I was just agreeing with HereHere’s comment on that veganism isn’t a guarantee that you won’t develop disease. Some diseases, such as high LDL or certain cancers are influenced by your genetics, therefore you eating a certain diet is not going to absolutely prevent you from developing it. Of course, I also agree with you- not one diet is ideal for everyone. I’m sorry that you struggled with nutritional defiiciencies for so long; I hope you’ve found a nutritional plan that works for your body and lifestyle. this talk was absolutely fantastic. i completely agree with both you and matt, and love all of the points you both brought up. thank you for talking about this, and i would LOVE if this was conversation was explored more through a book. i wish that the question and answer session was on here as well, was that taped and up somewhere perhaps? Finally got around to watching the video! Such an interesting topic that i’m very interested in…as an ex-vegan. I initially went vegan because I thought it was the healthiest diet for everyone, including myself. I remember when you first posted on your health crisis and I remember thinking you were so brave for sticking to your moral dogma and for sharing it with all of us. At the time I was an egg eating ex-vegan. Now I’m an ex-vegetarian and it’s with a heavy heart that I say it aloud / write it here. Personally, I was very conflicted and like you, I’m stubborn. I had SO much inner turmoil when I was faced with a difficult dietary decision. Even as the facts were in front of me I was trying to figure out a way to make my family plant based, it just wouldn’t work. If nothing else, I know you can empathize with me as a mom. You see, at 9 months old my son had an anaphylactic reaction to peanuts. Up to that point he’d been a healthy happy fruit and veggies loving babe (we’d been introducing foods one at a time as recommended – hadn’t yet reached allergens like gluten, dairy, etc.). But after his blood work showed he was allergic to peanut, sesame, tree nuts, soy, wheat, gluten, and dairy…well…it left me perplexed on where to turn. I explained to our allergist and other MDs that we were vegetarian and that nuts and seeds made up a large part of our diet and I was told to avoid all nuts and all seeds (minimum) until he was 2. Additionally, since I’m breast feeding, I had to remove them from my diet as well (amazingly, that cleared up his eczema in a flash!). So what’s a vegetarian to do without soy, nuts and seeds (he HATES lentils and beans)? The MDs literally said, no hemp, no chia, no flax, none of it until he’s at least 2 years old and we can reassess. My son needs to grow and develop properly! I need to ensure he’s getting all the nutrients! 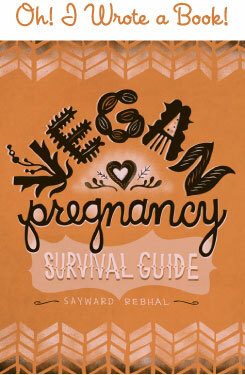 I’m a smart woman, but I’m not an expert and there wasn’t anyone I could turn to who had the knowledge to guide me down this path in a vegan friendly way! I feel guilty for what I chose, but at the same time, I know in my heart that I have to put my son first. What kind of mom would I be if I chose others over my own offspring? It’s a choice I never thought I’d make, and yet, here I am. Maybe if we were still in Los Angeles there would be more resources, but either way I’m glad you’re putting this conversation out there. If nothing else, it would be great to have more specialists with education for vegans and vegetarians when they hit crossroads such as ours. Thank you SO much for sharing this talk. You and Matt are doing something really important. As a fellow vegan blogger (and just a vegan in a non-vegan world), I can relate with the idea of having to be that perfect beacon of health, happiness and energy all the time. The thought goes—if I don’t present myself in this way, no one will consider a vegan lifestyle. But by denying authenticity, it presents expectations and experiences that not everyone will have if/when they go vegan. Because everybody is different. By opening this dialogue, I think we have a better chance of preventing ex-vegans. It just keeps things real. I’m not sure if my rambling made any sense, but thank you for sharing this thought provoking video. What the heck is all that background noise? I kept skipping ahead hoping it would be gone so I could actually hear you without you such considerable effort at concentration. Thank you for your talk. I relate so much! If you don’t mind me asking, what did you change about your diet that helped you get better? I think it would be nice information for any vegan to have. Thank you for sharing your story. What vegan foods do you eat now that helped raised your cholesterol and fix the markers for protein deficiency? What suggestions do you have for people who are plant-based vegan but are suffering from fatigue and don’t want to go back to eat animals? I ate a lot of protein shakes made with full-fat canned coconut milk (protein + saturated fat), tofu, beans, and lentils to correct my protein issues. I learned how to incorporate a concentrated protein source into every meal, which is important for my overall long-term health as well as my feeling of satisfaction ad satiety in the short-term (I used to crave sugar and snack a lot more, but now I don’t need to). To correct my low cholesterol and hormonal issues, I did the seed cycling (see here: ) as well as eating LOTS of saturated fats (coconut products and cocoa butter) as well as other healthy fats (olive oil, nuts and seeds, avocado, etc).